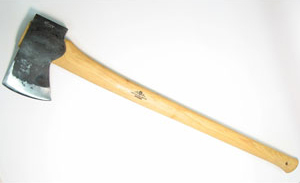 In this short video Jim Dillon explains how to choose the right broad axe for your shop, making your work more efficient, safer and far more enjoyable. A dull Axe is no Axe at all. Any tool with a blade is almost worthless unless it is sharp, and when it comes to sharpening tools you can do it the hard way, the wrong way or the best way so make it easier on yourself and get the right information and the right tools for the job. 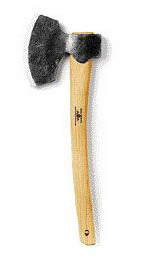 Axes come in all shapes and sizes, from small 1-1/2 pound hatchets to large broadaxes with a 14" edge. While we don't use every axe style, we do use many of them regularly in our work of building and restoring traditional timber frames.